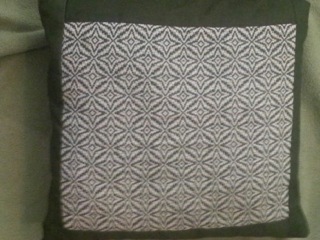 This pillow, by Jodi Paley, is part of the Black Sheep Handweavers Guild Friendship Coverlet project. For more about the project, please visit the Friendship Coverlet page – the link is in the right-hand menu, under “Other Cool Stuff”. This entry was posted in Featured textiles. Bookmark the permalink. Both comments and trackbacks are currently closed.